Social networking just got profitable for the consumer with credit card firm American Express teaming up with geo-location social networking site Foursquare. While Foursquare has a sizeable user base, it trails behind Facebook which also allows users to check-in at cafes, restaurants and other locations. But the team up with AmEx could be a game changer for the fledgling social network. Launched in 2009 Foursquare has grown slowly to around 20 million users who use the service to 'check-in' at locations anywhere in the world. These locations may be shared publicly or with a specific group of friends using the service. Users may also opt to share their location by linking their Foursquare account to Facebook or Twitter. Such geo-location services have existed for some time. Google first launched such a service called Latitude, which can be set to share location data with a group of friends, and if desired on a constant updated basis. Facebook too also launched a check-in facility in 2010 for those accessing the site through a mobile app. Foursquare differs in that users get rewards for their check-ins. As well as collecting a series of 'badges' and obtaining kudos by becoming the 'mayor' of a venue after checking in several times, Foursquare users may also benefit from discounts. In the past several coffee shops and pubs have offered the 'mayor' of certain venues anything from a free coffee to a discount on a meal. But since there can only be one mayor at any specific venue, such offers limit their attractiveness to consumers. By teaming up with American Express more customers are likely to be drawn to a restaurant or bar hosting special deals. After linking their American Express card to their Foursquare account, users can take advantage by searching for specials nearby using the application on their mobile phone. On arriving at a participating outlet, the user would 'check-in' as normal and tap the 'load to card' offer. After paying with the synced card any savings will be credited to the AmEx account within 3-5 working days, the credit card company says. The partnership follows a similar tie-up in the US launched last June and is becoming an increasingly common business model. Yelp offers business owners the ability to add Check-in offers to their venues, Facebook promotes Places Deals while Android smartphone users in the US have begun receiving Google Offers on their handsets' maps since the start of the month. Other apps such as Moneysupermarket, Vouchercloud and Myvouchercodes also help consumers identify close-by special offers based on GPS data gathered from a user's handset. But the tie in with a major payment card puts Foursquare ahead in the game. "Most of our competition has launched apps that are single functionality - apps that are purely about discounts, or maps or recommendations," Evan Cohen told the BBC. "At Foursquare what we are trying to do is build a multi-faceted experience so that a user, who might be opening an app to see where their friends are or a recommendation of where to go next, might stumble upon a deal." American Express says it is uniquely positioned to offer the service thanks to its "closed-loop" business model in which it acts as card issuer, merchant acquirer and payment processing operator. The firm's vice president of international social media strategy, Stacy Gratz, said this had helped attract outlets such as Tesco, House of Fraser, Primark and Nando's to the scheme. "Merchants can host these types of special without needing to train their staff, which can be timely and cost prohibitive," Gratz says, "We can then go back to the merchant and give them information about the number of people that redeemed the offer and also the amounts that the card members were spending, so we can provide to them pretty rich data." In the past promotions offered by venues have confused both staff and customers. tvnewswatch has experienced this first hand a at least one venue when trying to take advantage of a deal offered at a Wetherspoon's public house. A great deal of explanation was required to perplexed staff concerning a 20% reduction offered on meals to the 'mayor'. Despite having notices on display at the venue promoting the offer staff seemed unaware of the deal and confused as to how to deal with it. Since American Express acts as the mediator through the mobile app, there are no complicated discussions with staff, and in fact they need not know the customer even took advantage of a deal at the time. Of course some may see the tying details of one's credit card to a social network to a social network as being somewhat risky. 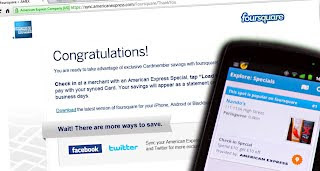 However American Express stresses that it does not share data on its members' spending habits with Foursquare nor does it divulge card details to the geo-location service. Quite a number of well-known franchises will be offering deals through the AmEx-Foursquare partnership at launch, including Bella Italia, Cafe Rouge, Eat, House of Fraser, Nando's, PizzaExpress, Primark, Strada and Tesco. These retailers are each offering £10 cash back on purchases of £10 or more, except Eat and Tesco, which are offering £5 cash back on purchases of £5 or more. AmEx users may go here to sync their card to their Foursquare account [FT / Mashable].